On May 21, thirteen Jackson Hole High School Key Club members, faculty advisor Mark Pommer and IC 21 President Susie Rauch traveled to the Wind River Reservation to assist in a community garden planting project. Jackson students worked with elementary, middle, and high school students and teachers from Ft. Washakie School and WY Indian High School, planting various vegetables and fruits including summer squash, pumpkins, watermelons and spinach. 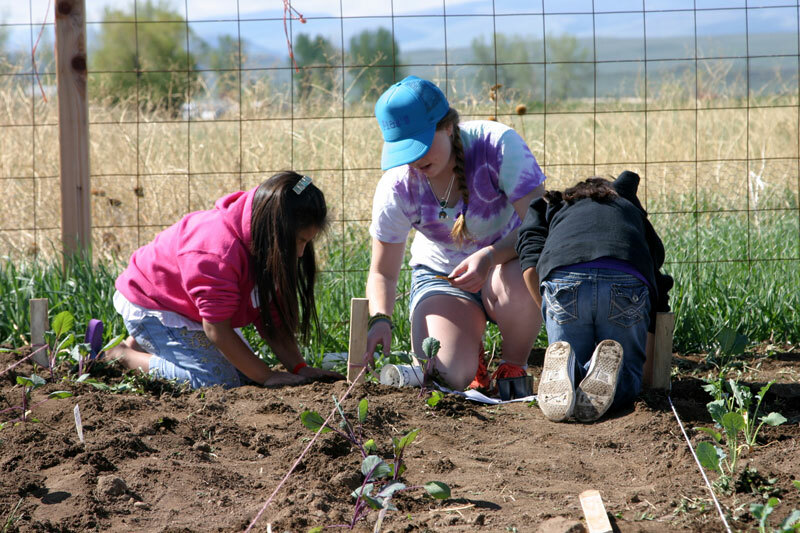 Many Jackson students acted as section leaders in the garden outside Fort Washakie Boys and Girls Club, where they each paired with a Fort Washakie high schooler and led an elementary school class in the planting of over 22 rows of fruits and vegetables. Meanwhile, the remaining Jackson students worked at Wind River Tribal College in Ethete with high schoolers from Wyoming Indian, building a new fence for the garden and planting the 4000 square foot plot. Longtime area resident and Ft. Washakie School teacher Fred Groenke—affectionately known to most as “Farmer Fred”—headed the project in collaboration with IC 21 and several local organizations. Dry Creek Charities of Salt Lake City provided funding for development of the gardens. Prior to planting day, Jackson Hole Community School senior Morgan McGlashon and IC 21 Program Associate Evan Huggins traveled to the Reservation where they worked with Farmer Fred to lay groundwork for the project, encourage participation of Wind River students, and brainstorm ways to ensure the planting day’s success. This ongoing project addresses critical issues of health and nutrition on the reservation. Farmer Fred, IC 21 and other participating organizations hope the gardens will encourage better eating habits, result in a drop in type II diabetes, and provide nutrition education to local residents. In addition, it is promoting understanding between community members and students of two very different cultures living in the state of Wyoming.